I started my analysis of prepositions in an earlier post by analyzing two sentences from the auto-ethnography, one written by Maha Bali and one by Sarah Honeychurch. This quickly revealed to me that I was not going to manage this analysis by hand. The base text of the auto-ethnography (excluding the marginal comments) has a total of 23,717 words and 3,763 unique words. This is large. Moreover, I am interested in tracking the connections made among all the prepositions and all the entities in the text. The preposition of occurs 652 times, effectively creating 652 relationships among an as yet unknown number of entities. That's just one preposition. I can't track all of that with pen and paper or even a spreadsheet. Fortunately, there are many fine analytical tools becoming available to digital humanists, and I have chosen to start with Voyant Tools by Stéfan Sinclair of McGill University and Geoffrey Rockwell of the University of Alberta. I don't know the tools, so I'm learning as I go along. Nothing like doubling your workload. Anyway, I dipped my toes in the water with a quick analysis of one sentence each from Maha's and Sarah's contributions, and now I want to shift to the entire auto-ethnography, so let's start with a look at the text I am examining as it appears in Voyant, which takes full advantage of the Net to allow you to embed its various tools. I'm embedding the tools separately below, but you can engage the entire data with a set of tools here. You'll see immediately that all the images have been stripped. Voyant analyzes text, not images, and that is fine for what I want to do, I think (apologies to Simon, Terry, Kevin, and others who think and write with images). I made several edits to the text that I should mention here. First, I regularized the name for Rhizo14, which had a handful of variations (#rhizo14, rhizo14, rhizo 14, rhizo, etc.) that led to aggregation issues that I want to avoid. Second, I corrected obvious misspellings and abbreviations in the text (for instance, I changed Maha's abbreviated ppl to people and soso to so so). However, I did not change the text in a text message exchange between Sarah and Maha that was added to the auto-ethnography, as I wanted to preserve its distinction. Not sure why. Even by itself, I is clearly the dominant entity in the text, though it refers to at least 31 different people in the base text. 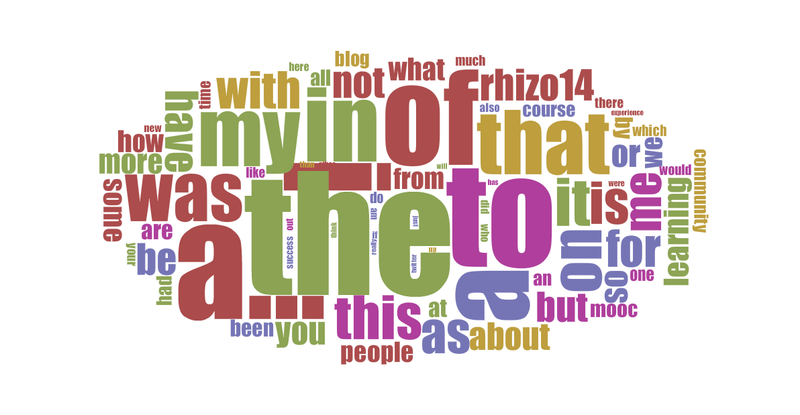 The small words (prepositions, conjunctions, being verbs, along with the articles that I excluded from the list) make up most of the top 50 words, but the prominence of the first-person outweighs them all, especially if we include the words related to I, such as my, me, I'm, I'd, myself, and I've. All of those words occur 1,512 times, and if we add the first-person plural words we, us, and our, then we have a total of 1,655 self references in the text. That's almost 7% of all words. Hmm. I started this post in the second half of October, 2014, but at the end of the month, I stopped writing here to help Maha Bali and half a dozen other rhizoers write Writing the Unreadable Untext. It was a fascinating experience that I blogged about, and it helps me rethink what I want to say in this post about the prominence of first person in the auto-ethnography. I'll restart with the observation in the last paragraph that the auto-ethnography has at least 31 unique voices in the core text, which does not include the instructions and marginalia. The traditional approach, I think, would be to treat this auto-ethnography as 31 different stories with 31 different voices, and that is a useful approach that I will still pursue. However, the Untext demonstrates so well how quickly a swarm voice can emerge and dominate in a collectively produced document. In the Untext, we use lower case i to represent the first-person swarm in distinction to the first person singular or the first person plural voice. This was most revealing for me, and wildly fun. Unlike the Untext, the auto-ethnography reinforces the notion of 31 individuals: it has 31 distinct stories with headings to identify 31 unique individuals. They all share a common topic—their experiences in Rhizo14—but the structure of the auto-ethnography brings into relief the unique perspective and voice of each author. Thus, even when we think of them as a group with perhaps a group voice, like a choir, we assume a unity, a unified voice, all arcing with complimentary, collaborative trajectories. And if this voice, this unified, coherent trajectory breaks down, then we fault the skill of the writers. This is the voice that we in Western culture understand and expect. It is the voice that I learned—absorbed, really—when, as I was preparing for my doctoral exams, I read most every Western rhetoric from Aristotle and Isocrates to Young, Becker, and Pike. This unified voice is at the core of Western rhetoric, so deeply embedded that most rhetorics do not mention it. They just assume it. This is the voice I am using now. The voice in this post is one version of Keith Hamon the scholar, who has a unique and recognizable voice, a peculiar filter of this world with a peculiar way of expressing the world. I like this voice, and I do not intend to abandon or denigrate it. But I am fascinated with the swarm voice, the voice in the whirlwind, in the trees, in the surf. I have heard this voice while waiting for the concert to start or the light to change. I have watched this voice emerge in the Untext, and I cannot ignore it. I have to learn more about it. I confess up front that I know almost nothing about the swarm voice, though I think I hear it in some of the writings of Deleuze and Guattari and perhaps of Serres. It's a voice that captures me, but I don't know why. It seems incoherent, which at first made me fault the writer and the writing, but now I'm wondering if I should fault the reader: me. I think the swarm voice is more common than we think. Indeed, I think I agree with Serres that the swarm voice, noise, is far more common than the familiar voices made legible and brought into relief by unity and focus, by our attention. This swarm voice is the voice of the street corner, the restaurant, the crowd. This is the hum we hear when we are attending to something more legible, more pronounced, more clearly enunciated. This is a fine place to start an analysis of the auto-ethnography: with the swarm voice. I will address the first-person swarm and the hundreds of small words that push the hum into the world, but as soon as I do I encounter problems, the first of many I expect to deal with. Note first that most of these top 25 words are short, one syllable, connector words. In fact, there is a direct relation between the frequency and the length of a word: the shorter a word, the more often it occurs in the auto-ethnography, as the following table and chart show. 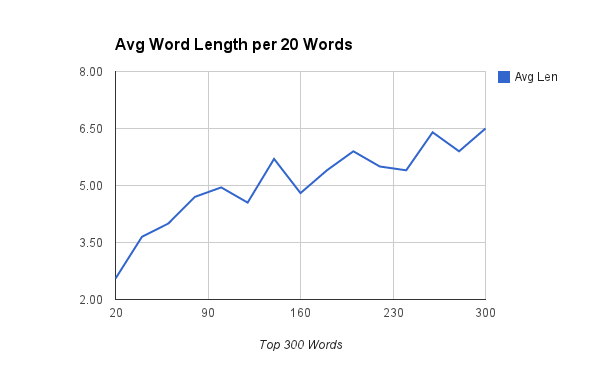 I grouped the first 300 words by 20 and calculated the average length. Even an English major can see the trend here. Short words occur more often, long words less often. That's likely true in most conversation and writing, but eventually, I will need to compare the frequency and length relationship in the auto-ethnography (AE) with some other documents to see if there is anything unusual about the AE, but later. I mention this here and now mostly because I can, but the point for me now is that the iSwarm is connecting to, and, of, in, on, for, as, with, but, and or other entities within the AE, and all of those entities are connecting to each other. Rhizo14 is a quantum hive of activity, all abuzz with energy. I think I knew that, but I like seeing it so clearly when shifting my vision up to the swarm scale, but what is the iSwarm connecting to? Not until I get to word 9 it (295 occurrences) do I find another entity to which I might guess the iSwarm is connecting to, with, of, in, and so on. Actually, it seems a fine other entity to which iSwarm might connect first as it is as much a swarm word as is I, and at this scale, I cannot tell who is connecting to whom or what. Rather, it's like watching a swarm of bees and trying to determine which bees are connecting to which. There's a general hum here, but I cannot yet make out its contours and modulations. I really don't know how to listen to noise very well, but I'm learning. I don't reach a definite entity until word 22 Rhizo14 (144 occurrences), which is also the first word longer than 4 letters and one syllable. As I've already noted, this is something of a manufactured word as I standardized the spelling of the names of the MOOC in the AE. Still, it demonstrates to me that one of the foremost connections of the iSwarm was to the quantum hive: Rhizo14. I have an issue with calling Rhizo14 a definite entity. It suggests that a swarm of people (including the 31 people in the AE) connected to a thing that already existed quite apart from their connections to it. I don't think that is how it works. Rather, I think that Rhizo14 emerged as a somewhat coherent, identifiable, and addressable entity out of the swarm of hundreds of people, including these 31 auto-ethnographers. I really do think that the community (the swarm) was the curriculum (the emergent entity). In this sense, then, I can say that Rhizo14 worked: it embodied the community as curriculum as a demonstration rather than as a teachable concept. Those of us who attended to it sufficiently and who were willing to engage the hum, the swarm noise, see the community as curriculum, even if we cannot quite say what it is. I'm hoping that following the desires of the prepositions in the AE will give me some language to say what I mean. I'm working on it. More about the iSwarm soon.